I am fortunate to have plants growing naturally right on the doorstep here in our garden. Although the original Marlborough daisies were planted here, they now seed readily and new plants grow. They often germinate in a crack in a rock, and the tap root burrows down through almost impenetrable substrate to source water an nutrients. The Marlborough daisy (Pachystegia insignis) grows naturally on dry, exposed cliffs and rocky outcrops in the northeast of the South Island. 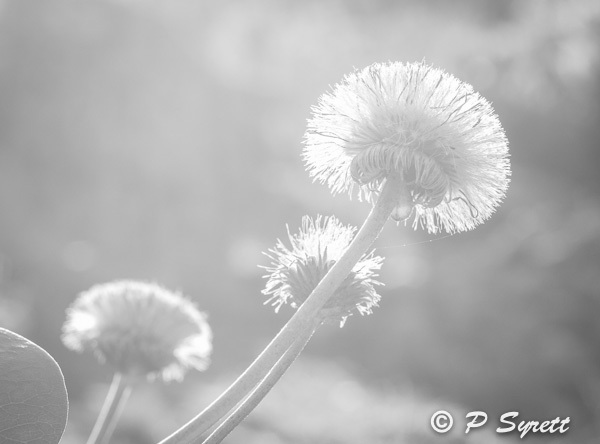 I converted this image to monochrome to emphasise the lightness of the seed heads.